Yesterday I went for a walk on a track immediately across the road from my house. 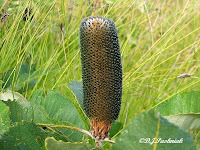 The land here is on the edge of the Great Sandy National Park. At first the track crosses a flat section but then it climbs quite steeply up some rocky hills. The low lying land is covered with typical wallum vegetation. 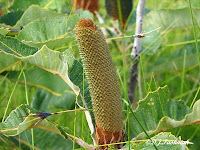 One of the plant species found in this habitat is the Swamp banksia (Banksia robur). 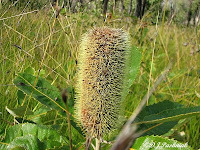 This banksia is from 1 to 3 meters tall and the flower spikes are 10 to 20 centimeters long. 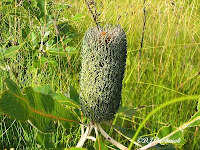 The flower spike is first green, then opens into a yellow color and finally fades to orange and brown. The change of color is most spectacular. This Spangled Drongo (Dicrurus bracteatus) came and sat on the power lines next to my house yesterday. Its handsome appearance certainly does not match its raucous voice. My birding book says that they are not shy but this is certainly not true for the few times they have come into my yard. As soon as they have seen me they have taken off. For this picture I was able to come around the side of the house in the shadow and then move closer in the cover of the hedge. Three or four days before this I had seen another two of these birds in the yard but my pictures were not clear. The general appearance of the birds was the same and they were making the same raucous noises. However, one of these birds was displaying a feature I have not seen in the bird books. Feathers on its head were sticking up like two little tufted ears. Another birder told me that he has only seen this once before. Does anyone out there know more about this display? 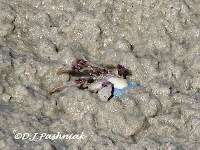 Out on the sand flats at low tide hundreds and thousands of soldier crabs run busily around. If you stand still and listen, all the tiny feet moving over the sand and through the shallow puddles sound like the rustle of silk. Roosting terns are surrounded by armies of little crabs. They walk and swim through the puddles left by the retreating tide. 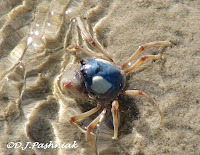 If they feel endangered they simply burrow down out of sight into the wet sand. Yesterday, I joined 22 enthusiastic birders for a most enjoyable day of bird watching at three different places in my local area. 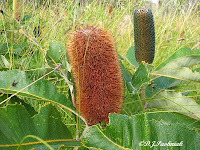 First stop was the Seary's Creek Picnic Area on the Rainbow Beach Road, then on to Bullock Point boat launch just across from Inskip Point, and finally we spent most of the time at Inskip Point. We had a great day and saw a total of 56 species of birds. The best thing about the day was the large number of honeyeaters we saw around the winter flowering trees. The most frustrating thing was the speed at which these little birds moved! I took so many photos of “blurs” in the tops of the trees! However, I got a couple of photos of birds that have eluded me until now – a Little Shrike-thrush (the rufous form) and a Red-backed Wren. This latter photo is still not showing the head and front of the bird but considering the number of times I have only managed blurred images in the long grass I am quite pleased with this one. At the end of the day, when we were all sitting around in our picnic chairs and enjoying a final “cuppa” (cup of tea or coffee for those not familiar with the Aussie habit of shortening words and phrases!) and having a talk about what we had seen, two Beach Stone-curlews walked out of the grass right next to us. I have seen these birds before around the Inskip area and it always amazes me that these rather shy birds have taken residence here. 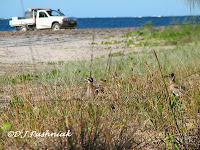 This time I got photos of the birds showing how close they are to the fishermen in their 4 wheel drive vehicles. Of course we looked for Black-breasted Button-quail which are known to be in this area but all we saw were the scrapes (platelets) they had left. Possibly our lack of success was because of the size of our group and all our excited talking about the birds we were seeing! Last Wednesday I went down to the Noosa river to join a group doing a survey of the birds on the sandbanks at the mouth of the river. The group does both a high tide and low tide survey during the day. In the late afternoon and early evening they count the terns flying in to roost on the sand banks after fishing out at sea during the day. I always enjoy a day down there but more importantly I learn a lot from the others who are all much more experienced birders than I am. 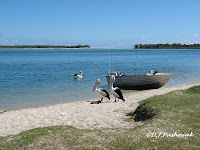 I see many of the same birds here in the Tin Can Bay inlet and at Inskip Point. 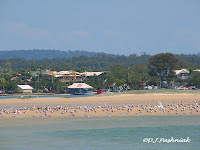 However, down on the Noosa River there are so many more boats and people that the birds seem to get used to more disturbances. Of course, too much disturbance is detrimental to the birds and the Noosa council addressed this problem last year by closing the sand banks to 4 wheel drive traffic. The council also stopped all access on some of the islands for the summer season – October to April. This has stopped all disturbances during the time when the local waders are breeding. The highlite of the trip for me this time was a Black-necked Stork – a Jabiru. However, this bird was watching me even more closely than I could see it and every time I got within camera range it moved off. All I got was some long-distance and rather blurry photos. 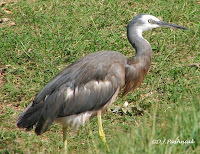 At Munna Point where we pick up our boat transport for the day I got some good pictures of White-faced Herons (Ardea novaehollandia). I see this bird quite frequently here in the Tin Can Bay inlet but it will never let me get close enough for really good pictures. At Munna Point where there are people moving around all the times the birds were quite approachable. There were two birds – one without the white face which I assume was a juvenile bird. Terns and gulls are among my earliest memories of birds. 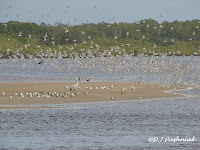 However, it is only recently - at the urging of a friend - that I have been taking a closer look at the variety in terns. In a later post I will take a more serious and sensible look at terns.